We drove over to Vermont Skydiving Adventures in rural West Addison, Vermont. 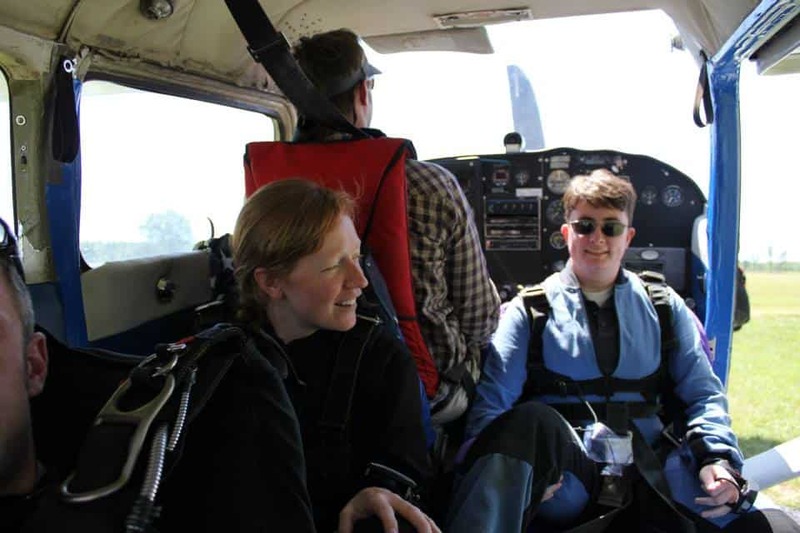 After training, suiting up and practicing, two of us, plus our skydiving instructors, the pilot and the videographer/photographer squished into a tiny, tiny plane. I skydived with my work supervisor and, yes, I wondered if I would have a job after this adventure. We sat on the floor and I was jammed tight between the door, the pilot and my instructor. Aloft, I felt and heard the roaring wind. I looked down and saw a gap in the door, giving me a bird’s eye view of the growing distance back to the ground. The adrenaline started pumping. At 11,000 feet, we maneuvered ourselves into jumping position. The little latch on the door was let loose and it flipped up with the force of the wind, revealing a horrific distance between me and the ground. My stomach was in my throat, the sound of the air merged with the pumping of blood through my veins. Look at the camera and smile. I wasn’t too capable of this on my own, so my instructor moved my head toward the camera, then away from the camera and back up into position. You can see the embarrassing photos below. Clearly, I was too shocked to look at the camera myself, so my instructor had to maneuver my head manually, producing these priceless photos. Gravity had a 130 MPH downward grip on us. The force of the air shoved my breath back down my windpipe. Eventually, the instructor signaled to extend my arms and get out of the fetus position. Then he signaled to pull the rip cord. I pulled hard and suddenly we reversed direction, going up again. We floated and turned and swooped. This was the only time my stomach felt queasy, but I didn’t want it to stop. I wanted to savor this and stay, live up here in the clouds forever. On the ground, our reactions ranged widely. I was excited and didn’t know what to do with all the extra energy. Joe was the best: grinning ear-to-ear, his hair blown back, he glowed/floated off the landing field. I can vividly re-inhabit two moments: when the airplane door opened dramatically and right before I jumped and it was all before me. The adrenaline rush is still accessible and it was an experience of a lifetime. If you haven’t gone skydiving, don’t let it linger on your bucket list. 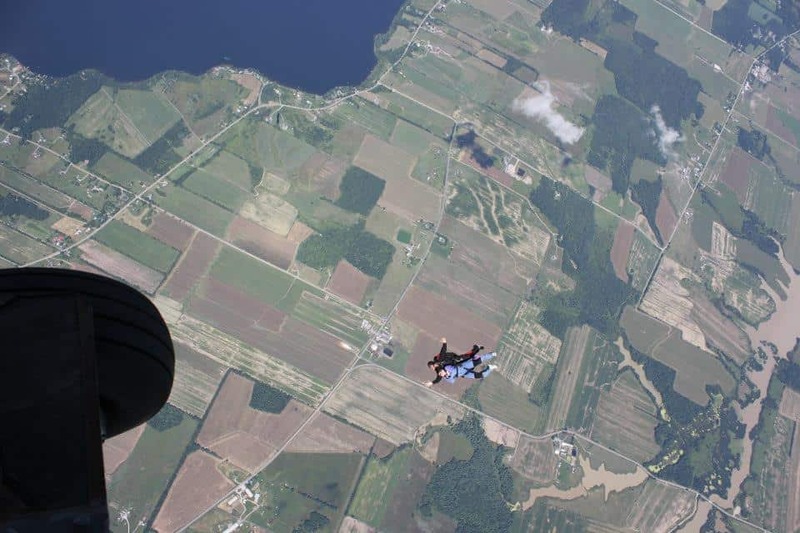 The US Parachute Association states that tandem dives, perfect for the beginner, cost between $150-$250. It’s worth a few months of brown bag lunches or skipped lattes. But, beware: other bucket list goals may pale in comparison to the thorough adrenaline rush that skydiving provides.